The ECW bodied Bristol LH was a popular choice of small bus for many National Bus Company group operators during the seventies. The ECW body was available in either 7.6ft & 8ft wide form and the bus proved a reliable and long lived workhorse that was often snapped up by smaller operators after their original owners had disposed of them. 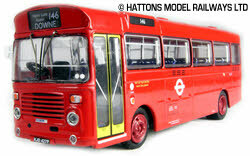 London Transport had a fleet of 95 BL Class vehicles built to the narrower layout, there life in the capital was relatively short however with most being replaced by new vehicles in the eighties.